If we concede, as I have argued, that design and reconstruction are acts of propositional making performed in the present, then this makes available the possibility of a chronotopic Plan of Work, more like the recursive ideal of the chaîne opératoire. The hegemony of those institutions which would keep these disciplines separate, can be seen in the work, for example, of contemporary archaeologists and anthropologists concerned with the teasing out, forging or re-establishing of relationships between archaeology, architecture, art and anthropology, the absolute separation of which for them has been felt to be problematic. Tim Ingold, for example, through his, The 4 A’s: Anthropology, Archaeology, Art and Architecture seminars at the University of Aberdeen, analysed how art and anthropology may share goals and methodologies, and likewise for architecture and archaeology; how they may share homologous aims. 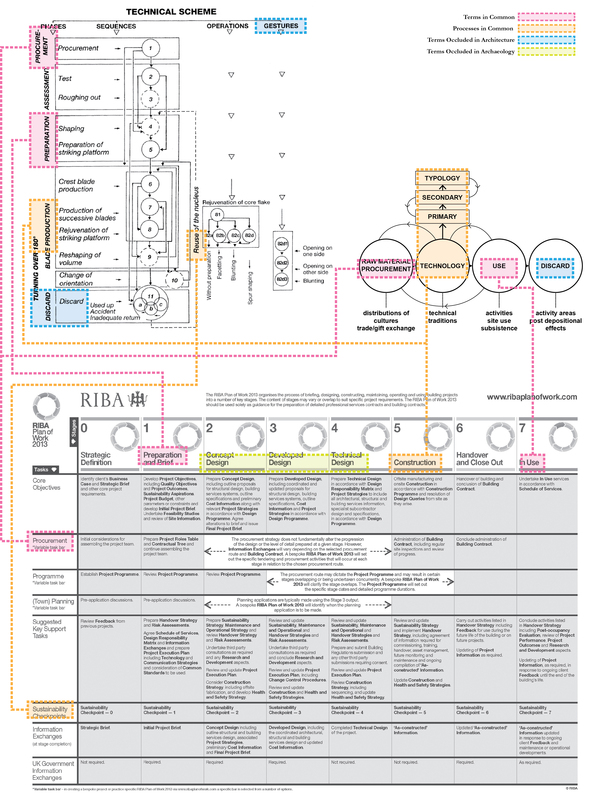 In light of all this one can see the RIBA Plan of Work and the chaîne opératoire engaging in a kind of abbreviated diagrammed conversation, revealing occluded disciplinary aims or offering alternative ways of apprehending otherwise conventional processes. These ‘revelations’ are precipitated only through their interdisciplinary use or analysis. There was, over time, a constant manipulation, and re-creation, of the chaîne opératoire from detailed tool employed to analyse the life-cycles of the products of specific technologies to, at times, grossly simplified yet elegantly conceptual versions like this by Jacques Pelegrin, returning almost to Leroi-Gourhan’s earliest formulations of an over-arching model of evolutionary shift. This oscillation between broad idea and specific application is entirely missing from the development of the Plan of Work. The only aspects of the Plan which are ever dealt with in detail by architects are those which concern design. Shuttling between the “conceptual” and the “operative” as Pelegrin does, it becomes clear that the feedback is not simply between parts of a construction process (whether building or lithic) but between the human and the technical. Until, as Leroi-Gourhan claimed, they become indivisible. This ‘diagram of diagrams’ attempts to work “diagrammatically” in the sense meant by K. Michael Hays. Hays explains that to work diagrammatically is not the same as “simply working with diagrams,” instead it “implies a particular orientation, one which displays at once both a social and a disciplinary project.” In his close reading of Gilles Deleuze’s Foucault, Hays emphasises this point, “Deleuze’s reading of that diagram [is] a cartography of an entire social and historical field,” precisely Leroi-Gourhan’s intention for the chaîne opératoire. An architectural projection is graphically divined through rules when the opportunity for construction arises. The translation of edifices into drawings and of drawing into edifices is the foundation of the mantic paradigm in architecture. As for the Plan of Work, Leroi-Gourhan might have enjoyed the elision between processes of technique and the implication of human interface, the embedding of the human in the technical process. But its denial of temporal fluidity would have seemed, to him, counter-productively turgid. I have argued above that the architect purports to practice in future-facing mode–to design artefacts to be made in the future, whereas the archaeologist purports to practice in past-facing mode–to reconstruct artefacts (or cultures) that were made, or which existed, in the past; an echo of Stiegler’s forward and backward facing–Promethean and Epimethean–temporal registers. I have also suggested that, like Frascari’s “mantic” or divinatory process, both the architect and the archaeologist in fact practice acts of propositional making, performed in the present through the indexical relationship between designer and artefact. In light of these correspondences, one can see the RIBA Plan of Work and the chaîne opératoire engaging in a kind of abbreviated, diagrammed conversation, revealing occluded disciplinary aims, or offering to each other alternative ways of apprehending otherwise conventional processes. These ‘revelations’ are precipitated only through their interdisciplinary use or analysis. By allowing them to talk to each other. Françoise Audouze, “Leroi-Gourhan, a Philosopher of Technique and Evolution,” Journal of Archaeological Research 10, no. 4 (2002): 284. Alessandro Zambelli, “Scandalous Artifacts: Practice between Archaeology and Architecture,” Architecture and Culture 1, no. 1-2 (2013). Herman Philipse, Heidegger’s Philosophy of Being: A Critical Interpretation (Princeton, N.J.: Princeton University Press, 1998), 275. Bernard Stiegler, Technics and Time 1: The Fault of Epimetheus, trans. Richard Beardsworth and George Collins (Stanford, Calif.: Stanford University Press, 1998), 132. R. A. Green and W. A. Watson, eds., Handbook of Architectural Practice and Management: 1st Instalment, 1st ed. (London: RIBA, 1963). Gordon Pask, An Approach to Cybernetics (London: Hutchinson, 1961). J. A. Powell, ed. Handbook of Architectural Practice and Management: 3rd Instalment, 1st ed. (London: RIBA, 1965), 3.210. The name given by Tim Ingold variously to a course, seminars and workshops in the Department of Anthropology at the University of Aberdeen from 2003 until the publishing in 2013 of: Ingold, Making : Anthropology, Archaeology, Art and Architecture. I attended one of these seminars in March 2008. Catherine Ingraham, Architecture, Animal, Human: The Asymmetrical Condition (London: Routledge, 2006), 235. Tim Ingold, Lines: A Brief History (London: Routledge, 2007), 3. Robert E. Somol, “Dummy Text, or the Diagrammatic Basis of Contemporary Architecture,” in Diagram Diaries, ed. Peter Eisenman (London: Thames & Hudson, 1999), 23. Gilles Deleuze, Foucault (London: Continuum, 2006), 30. Christoph Lueder, “Diagram Ecologies − Diagrams as Science and Game Board,” in Diagrammatic Representation and Inference: 7th International Conference, Diagrams, ed. Philip Cox, Beryl Plimmer, and Peter Rodgers (Canterbury: Springer, 2012), 215. Marco Frascari and William Braham, “On the Mantic Paradigm in Architecture: The Projective Evocation of Future Edifices,” Proceedings of the Association of Collegiate Schools of Architecture Annual Meeting (1994): 215. Jane Rendell, Art and Architecture: A Place Between (London: I. B. Tauris, 2006), 9-10.